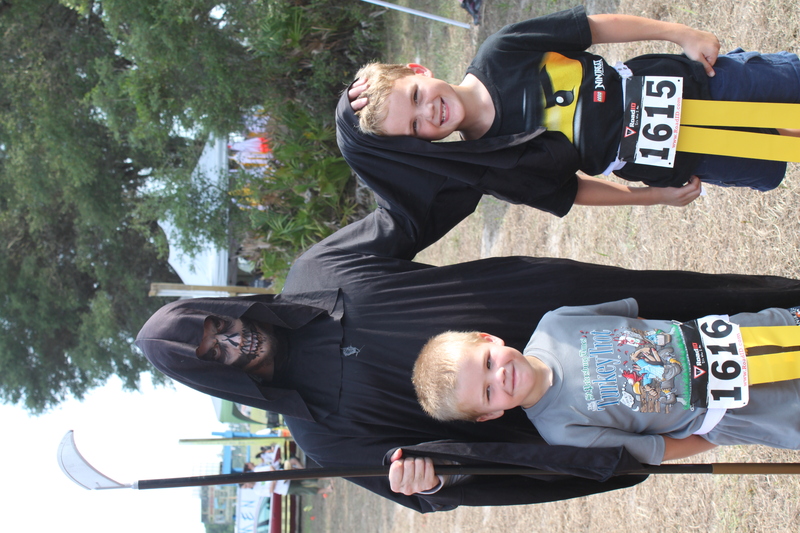 WINTER GARDEN, Fla. – The inaugural Monster Bash Dash seemed a bit out of place here in Central Florida in late May. Zombies and monsters were positioned throughout the woodsy 5K course laid out over the Roper Ranch, giving it a bit of Halloween feel despite the steamy temperatures. Rock On had professional face painters on hand to take care of the dozens of monsters, who hid in palmetto, behind trees, and whatever other brush they could find. Athletes wore belts with two flags on their hips, which monsters lunged for the athletes attempted to go through obstacles. My 9-year-old and I ran the daylight 6 p.m. wave, which probably didn’t give us the full monster experience, though we had a great time. Our wave was modest since most people opted for waves at 8 p.m. or later, which took place in the dark — headlamps mandatory. We only made it halfway through with our flags. At that point, we served as blockers for a 12-year-old running alongside us, though he didn’t make it to the end either. The obstacles were mostly things hanging from trees, along with branches, and that’s where many of the monsters lurked. There also were haunted houses and a few walls, but mostly the obstacles were dodging the monsters themselves. The challenge was to speed up through the obstacles to dodge the monsters, who would pursue. We were very impressed with the two Highlander obstacle races Simpkins and his better half Wendy Carson put on last year. The third one will be Sept. 22, also at the Roper Ranch. That venue also will host Rock On’s other adventures: the Yakathon (bike-kayak-run) on July 14, the cops-and-robbers themed Hot Pursuit 5K (Aug. 11), and a Halloween-time edition of the Monster Bash Dash (date TBA). Rock On always takes kids into account, whether it’s staging kids races, having kids games and activities or simply by not making beer a focal point of the event. Rock On also does not charge for parking for participants. Perhaps that charge is reflected in the entry fee, but athletes seem to appreciate not getting nickel and dimed. Simpkins has encouraged other obstacle race directors to adhere to high standards and a number of them were on hand helping with the Monster Bash. Given a few trainwrecks we’ve seen in this booming field, where it seems everyone is trying to get a piece of the action, some industry standards are welcome. We’ll be excited to take on the Monster Bash again around Halloween. Spartan Race, the grueling obstacle race series featuring penalties of 30 Burpees for each challenge not completed, is taking its show to Fenway Park, the historic, 100-year-old home of the Boston Red Sox. Spartan Race typically sets up in remote areas, staging events of between 3 and 12 miles and consisting of 15 to 25 obstacles. The Fenway Park event will be a one-mile time trial taking place entirely within the ballpark on Nov. 17. 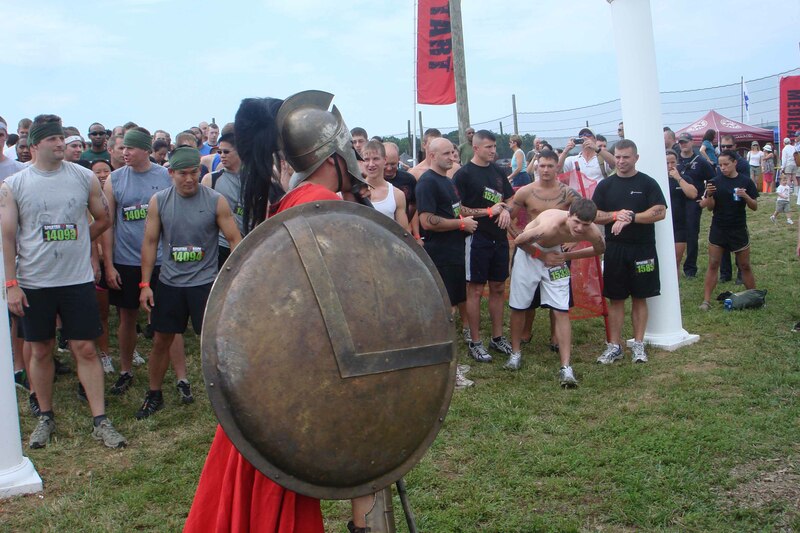 Unlike other obstacle events, Spartan Race does not provide course information beforehand. Joe DeSena, the creator of Spartan Race, would say that Fenway’s signature feature, the Green Monster left field wall, will come into play. DeSena, who is friends with former Red Sox general manager Theo Epstein, says he was contacted by the Red Sox to put on the race, the team’s latest foray into non-baseball events. For about 30 years beginning in 1973, Fenway Park was used exclusively for baseball. Since 2003, the Sox have staged everything from Bruce Springsteen and Rolling Stones concerts to the NHL’s Winter Classic. Though the Fenway version of the Spartan Race is just one mile long, it’s priced like a regular Spartan event – or a Red Sox game. It’s a whopping $110 to register through June 17 and escalates to $150 through Nov. 9. DeSena says the event is likely to sell out by Aug. 1, with 10,000 competitors expected to participate in what likely will end up being extended over two days. Even spectator tickets cost a whopping $40. “You go to Starbucks for breakfast you end up spending forty bucks,” DeSena says. DeSena, a Queens native who grew up a New York Yankees fan, made a small fortune on Wall Street before moving to Pittsfield, Vermont, where he operates a small resort hotel. An avid endurance athlete who once completed 12 Ironman triathlons in a year, he created the Spartan Death Race in 2005 because he believed Ironman and other ultra-distance events did not present a big enough challenge. Athletes competing in The Death Race, held annually in Pittsfield in mid-June, do not know how long the event will take place, what it will entail, or even the exact starting time. Last year’s event kicked off with competitors deadlifting rocks for six hours. The event had a religious theme and at one point athletes carried logs on their backs for 24 hours. The Death Race continued for 45 hours before DeSena called it with just 35 of the 155 athletes remaining. The Spartan Race, launched in 2010, is a scaled-down version of The Death Race consisting of the Spartan Sprint (3-mile), Super Spartan (8-mile), and Spartan Beast (12-mile plus) events. 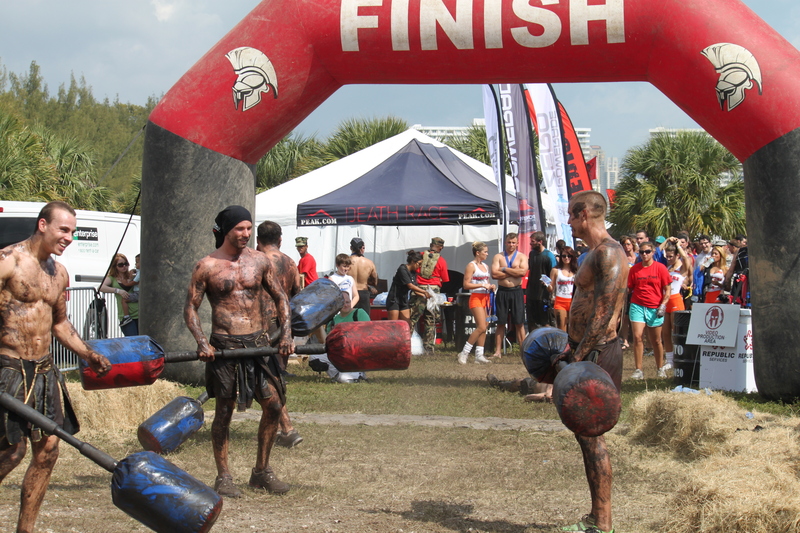 Athletes typically haul heavy objects such as five-gallon buckets of gravel, drag concrete blocks, climb walls, flip tires, and run a race-ending gauntlet of guys dressed as 300 Spartan warriors wielding double-sided mallets. Athletes also must perform challenges relating to the host property. At a Virginia event last summer at a paintball facility, athletes had to dodge gunfire and successfully hit a target from 10 yards away. Failure to do so earned the athlete 30 Burpees, the standard penalty for not completing challenges. Athletes typically do three or four sets of Burpees, which makes Spartan Race arguably tougher than other events in the category, including Tough Mudder, which do not issue penalties. 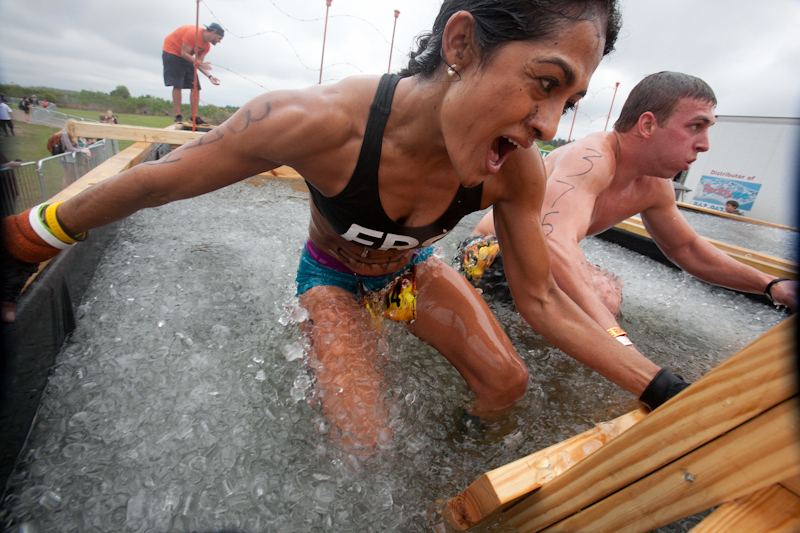 Tough Mudder, like Spartan Race, debuted in 2010 and now hosts dozens of events worldwide. Each series is likely to clear $50 million in revenue this year. Unlike Spartan Race, which issues timing chips and awards points in a year-long race series, Tough Mudder does not market its events as competitions but team-building exercises. Boston’s average high temperature for November is 52 degrees with a low of 38. DeSena said the cold and threat of ice and snow will only add to the Spartan challenge. The Fenway Park race could be the first of several ballpark Spartan Races, though athletes in Central Florida should not get excited about a Tropicana Field event. Medicine balls have been around for thousands of years and they continue to provide an effective workout, especially when it comes to developing rotational strength. 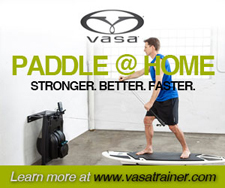 They’ve been a core part, pun intended, of the Core Performance books I’ve had the honor of writing with Mark Verstegen. In this segment, shot at TNL Tampa with the help of my trainer friend Sophia Zayfman, we demonstrate a few moves you can do with medicine balls to develop your rotational strength. As of this afternoon, I’m certified to train athletes, interview them about their performance, and write stories about them. That makes me something of a hybrid professional freak: the journalist/trainer. Actually, I have no intention of training athletes, though it’s nice to know I could. I’m now a certified personal trainer by the National Academy of Sports Medicine (NASM), one of the most prestigious certifying bodies in the world of fitness. 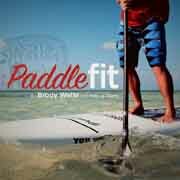 By passing a 120-question, multiple-choice test that seemed to be written in Greek, I’ve added a distinguished credential to my fitness journalist resume, which includes Paddle Fit certification, the premier stand-up paddleboarding credential I earned last year. The NASM CPT wasn’t easy. After nearly six months of off-and-on study and obtaining a CPR/AED certification, I tested for the CPT at the Clearwater Air Park, of all places. The small FBO airport has a 3,500-foot runway and a side business of certification testing, offering more than 100 exams for would-be teachers, real estate agents, personal trainers, and other professionals. At the check-in desk was a sign listing the airport’s rates. I could rent a Cessna for $98 an hour – were I qualified to fly. First, the CPT exam. I’ve long been envious of people in the fitness world with a lot of acronyms after their names. I write fitness-related books and articles and when I interview people with certain credentials, I know I’m going to get a wealth of insight and wisdom. But I’ve always wanted to earn a respected fitness credential to further my knowledge and bring more credibility to my work as a journalist. Not a physical therapy degree or masters in exercise science. Those are rigorous degree programs that take years. Certifications, however, can take as little as six months. For those who have graduated with degrees in exercise science, kinesiology, or athletic training, passing a test to become a NASM CPT probably is no more difficult than a law school graduate tackling the bar exam. For the rest of us, it’s more challenging to get up to speed on exercise science, anatomy, and human movement, to say nothing of learning all of the key concepts behind every aspect of training: balance, speed, core, plyometrics, agility, quickness, resistance, and cardiorespiratory. The study guide for the NASM CPT program is a whopping 623-page book called NASM Essentials of Personal Fitness Training. It comes with a handy, interactive chapter-by-chapter online study guide. 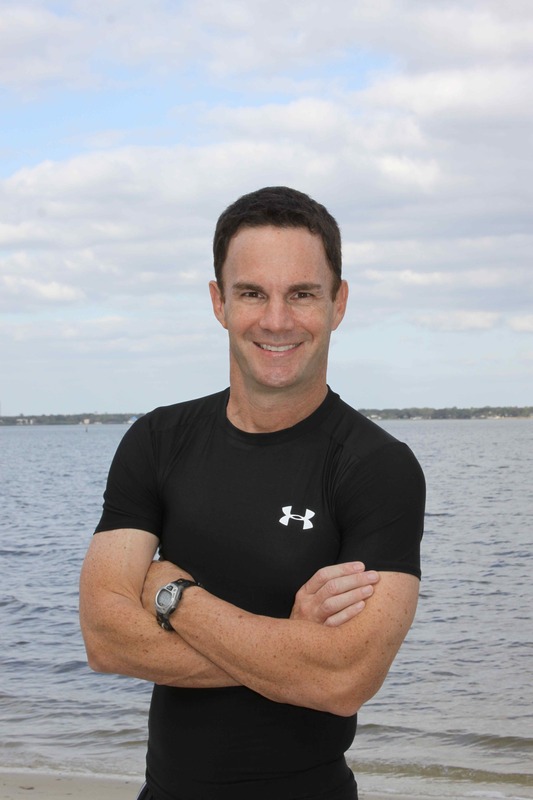 I was relieved to find a lot of the material familiar, having had the honor of writing five Core Performance books with Mark Verstegen and his staff at Athletes’ Performance. Mark, perhaps more than anyone, popularized the idea of core training. Since starting work on that book nearly 10 years ago, I’ve learned a second language, the same tongue used in the NASM training guide. I know terms like proprioception and reciprocal inhibition. I already could identify the three planes of movement (sagittal, frontal, transverse) the importance of active isolated stretching, and how to define three heartrate zones. I know the difference between abductors and adductors, why the transverse abdominis is so important, and why I have to work so hard on eliminating muscle imbalances throughout my kinetic chain because of an ankle I jacked in high school basketball. Still, I might have been hard pressed three months ago to explain the difference between the gastrocnemius and the soleus or how upper crossed syndrome is different than lower crossed syndrome. I knew my gluteus medius from my gluteus maximus, but might not have been able to point out my biceps femoris and psoas, even though I must work tight hamstrings and hip flexors constantly. So I felt pretty confident heading into my exam cubicle, which included a pair of earplugs in case the sound of Cessnas became annoying. I knew the 120-exam question would include 20 sample questions that didn’t count. They probably would seem off the wall, not necessarily pertaining to anything in the 623-page book, and would be spread out throughout the exam. I’d have no idea which ones they were. Unfortunately, most of the exam seemed like sample questions. There were few gimmes, and it seemed like I was taking educated guesses at most, typically eliminating two of the four choices and agonizing over the last two. I had to get 70 of the actual 100 questions correct, though I’d only be told if I passed or failed. It’s been some time since I took a lengthy standardized test, though I took many online practice NASM CPT exams, which were far easier. As I exited the cubicle, I didn’t feel too confident. If I failed, I’d have to pay $199 for a retest. I glanced at the Air Park menu. Maybe I could just rent a Cessna for two hours. The proctor/Air Park receptionist printed out my results and emerged from behind her desk stone faced. She’s probably been trained to show no emotion, I figured, not wanting people to feel any worse. “Congratulations,” she said, handing over the paper. I left pumped, not ready for the Cessna but certainly ready to fly. The sale is the latest move by Messick to focus Ironman on its primary business of long-distance triathlons. Messick was installed as CEO last May by the Providence Equity Partners’ Group that purchased WTC from the Gills family in September of 2008. Since taking over, Messick has scrapped Ironman’s plans to launch an obstacle mud race series called Primal Challenge, sold off a timing business, scaled back WTC’s one-year-old 5150 Olympic-distance triathlon series, and reevaluated every aspect of the company beyond the signature Ironman-distance races and the 70.3 (half Ironman) events. Lava, a reference to Ironman’s world championship in Hawaii, seemed like an attempt by WTC to take on Competitor Group, which publishes endurance books and magazines in addition to organizing the Rock ‘n’ Roll marathon series, Muddy Buddy races, and shorter triathlons. Lava is produced in California, far from WTC’s headquarters in Tampa, and comes across as a more upscale version of Triathlete magazine, which though owned by Competitor also tends to focus on Ironman events and professional triathletes. LAVA Media, LLC, will own and operate the magazine’s print, online and digital properties. 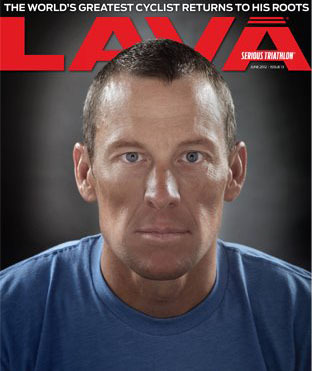 Ironman and Lava will continue a partnership, with Lava designated as the official magazine of Ironman. Tagged as Andrew Messick, Competitor Group, Heather Gordon, Ironman, Lava Magazine, Pete Williams, World Triathlon Corp.
Savage Race, the popular Florida-based mud run that adopted several of Tough Mudder’s obstacles for its race in March, now will use a venue Tough Mudder had great success with in 2011. Little Everglades Ranch, which drew nearly 20,000 participants over two days in December for the inaugural Florida edition of Tough Mudder, will host what will be the third edition of Savage Race on Oct. 20. Little Everglades is located in Pasco County in Dade City, more convenient to Tampa than the Clermont site Savage Race used in March and for its first race last August. Savage Race is the most successful of the Florida-based mud runs, drawing more than 5,000 participants in March. Building on the success of its first race in 2011, Savage Race in March expanded its course to nearly 5 miles and added several obstacles similar to those of Tough Mudder, including a “Shriveled Richard” ice plunge like Tough Mudder’s Chernobyl Jacuzzi, and a 10-foot leap off of “Davy Jones’ Locker” into a lake. Sam Abbitt, the co-founder of Savage Race, says the intent has never been to mimic Tough Mudder. He points out that Tough Mudder stresses camaraderie and a non-race format. Savage Race, on the other hand, is a chip-timed event with awards to top finishers. Savage Race packs about the same number of obstacles – roughly two dozen – into a course less than half the length of Tough Mudder. 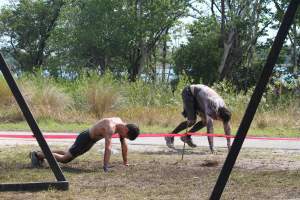 Tough Mudder’s decision in February to move the 2012 event away from Little Everglades was a surprise, though a Tough Mudder official said at the time the race series likes to vary its venues. 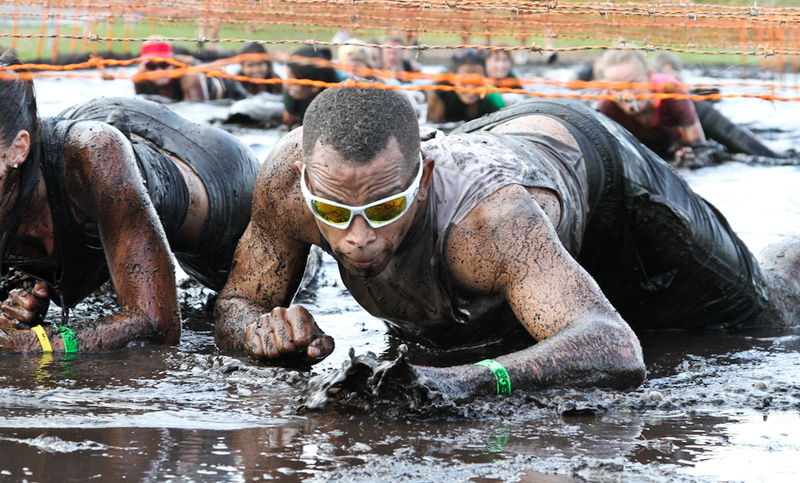 Tough Mudder will take place Dec. 1-2 in Fort Meade at Dirty Foot Adventures, which will host its own event, the inaugural Dirty Foot Adventure Run, on June 9. Abbitt said Savage Race moved to Little Everglades because it had outgrown its Clermont location, where a lack of parking had become an issue. Though the Little Everglades property, which hosts major equestrian and high school cross country events, can host long races such as the 12-mile Tough Mudder, Abbitt says he does not plan to expand Savage Race beyond six miles. 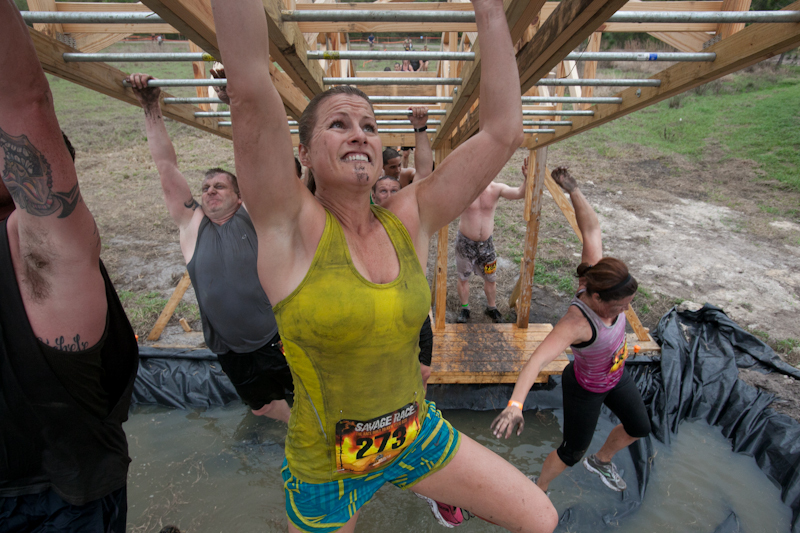 A number of Florida-based mud runs have sprung up in the last two years to challenge national event series such as Tough Mudder, Warrior Dash, and Spartan Race, all of which have built eight-figure businesses in a short period, staging dozens of events around the world. Savage Race seems the most likely to grow beyond the Sunshine State. Abbitt says Savage Race will expand beyond Florida in 2013, with dates planned in Maryland, Georgia, North Carolina, and Texas.